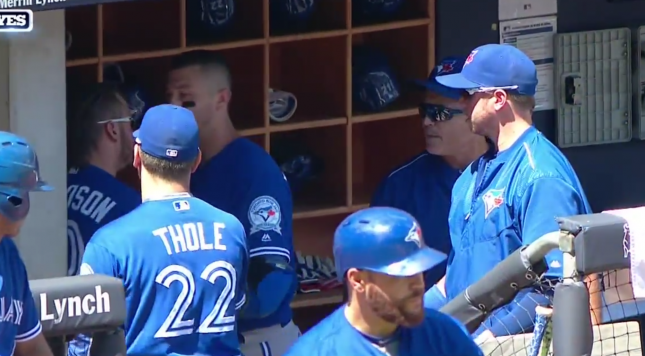 Things got heated on the Blue Jays bench on Wednesday afternoon. Blue Jays All-Star Josh Donaldson struck out against the New York Yankees and wasn’t happy. He went into Toronto’s dugout and slammed his bat against the ground. Manager John Gibbons wasn’t impressed with Donaldson’s attitude and decided to step in and let him know. Donaldson didn’t seem to respond positively to Gibbons, as the two got in a heated argument with one another. Shortstop Troy Tulowitzki stepped in between them, which seemed to calm both Donaldson and Gibbons down. Gibbons is no stranger to getting into arguments with players on the bench. He famously argued with Shea Hillenbrand in 2006, which led to the third baseman’s ouster from the team. Gibbons also got into an altercation with Ted Lilly in 2006, where it’s been long-rumoured the two got in a fist fight. Now, this altercation doesn’t seem to be nearly as serious as Gibbons’ previous public arguments. Donaldson was upset and Gibbons took exception to his behavior. It’s impossible to know what the duo said to one another, but it’s Gibbons job to manage, and if a player is lashing out, he has every right to tell him to straighten up. Still, it’s not encouraging the argument was done in public and involved Toronto’s best player. Good on Tulowitzki for stepping in before things potentially got ugly. Gibbons and especially Donaldson are too important to the club to become sudden enemies. I’d bet this incident will blow over quickly. Arguments happen. This one just happened to be public. It’s not a great look, but isn’t the end of the world.